Back in the 1970’s there were cars that are nothing more than faded memories now. Others still exist but they are mere shells of their former selves. The Impala comes to mind. In the early and middle 1970’s the Impala was a massive beast that prowled the highways. In the early 1980’s I owned a 1973 Impala. I painted it flat black, installed headers on the big V8 engine and piped the exhaust through two Cherry bomb mufflers, which weren’t really mufflers at all, more like pipes with a little bit of baffling thrown in. It was loud monster that shook the neighborhood awake each morning when I fired it up. Mothers pulled their children away from the curb when I drove down the street; people looked at me with disdain when I intruded upon their otherwise silent world. The final journey in the Impala came in 1985. I drove from the Florida Keys where I lived at the time, to Hurlburt Field in the Florida panhandle for some military training. There was no AC, that had died long before and the engine needed overhauling meaning it would lose about a quart of oil every few hundred miles . By the time I got to my destination I had stopped and added enough oil that there had been a complete oil change. But, with the windows down and a 10-speed bike occupying the back seat with no issues, I cruised up the entire state of Florida and loved every minute of it. I’m sure I lost at least 30% of my hearing, but I didn’t mind a bit. Shortly after my return, I took the engine out and sold the beast for scrap knowing I had squeezed all the life out of the old body and chassis. The rebuilt engine ended up in a 1978 Monte Carlo soon after but that is story for another day. The point is that unlike the Impalas of old today’s Impala, akin to many of the cars still around from the 1970’s era, is just another midsize sedan lost in a sea of otherwise unremarkable midsize sedans. It is nothing like its former generation other than the nameplate. That’s not true for every car however, and that’s a very good thing. 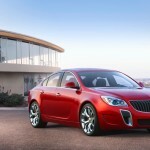 When Buick introduced the Regal in 1973, it was midsized sedan with capable power and a bit of the ever-present Buick bling. There were variants of the model that were actually quite fast and nimble, “sleepers” we old gear heads called them. As I found out recently, the Regal is still very much alive, and still very much like it was in the 1970’s. 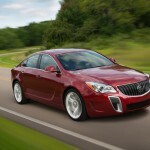 It’s still a sleeper, still a midsize sedan with a bit of Buick bling, and still a very fun car to drive. 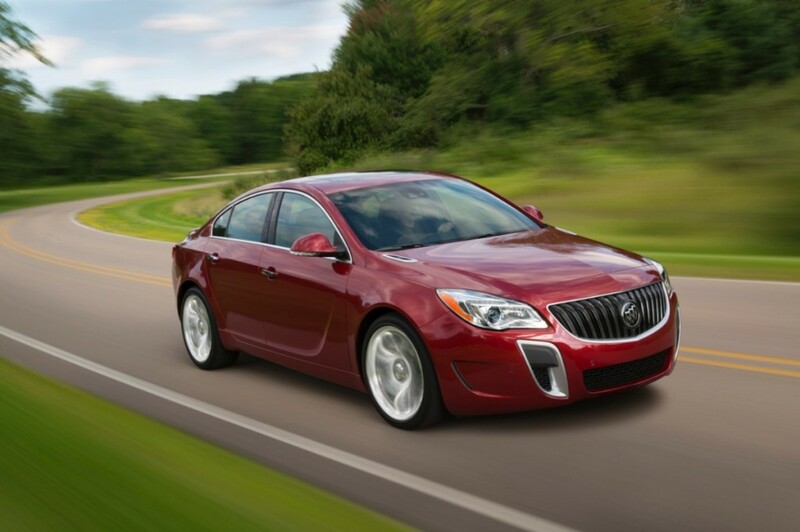 GM gave the Regal a refresh for 2014. There are new technologies that include new radar- and camera-based safety features – like Rear Cross Traffic Alert, Lane Change Alert, Side Blind Zone Alert, Lane Departure Warning, Forward Collision Alert and Collision Mitigation Braking – for surround protection. In-vehicle connectivity has been upgraded with the next-generation IntelliLink that features simpler, more intuitive controls and natural speech recognition. 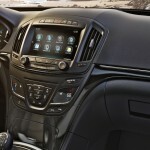 As I’ve learned with other GM vehicles the eight-inch color touch screen radio with Buick IntelliLink, AM/FM/Sirius XM (three months of service) stereo with CD player and auxiliary input jack, USB port and Bluetooth wireless connectivity for select phones is one of the best, and easiest to operate, on the market. The IntelliLink is standard on all Regal audio systems. • Ice blue ambient lighting. There is also one of my all time favorite features on any car: Adaptive Cruise Control available as an option. For the uninitiated , adaptive cruise control senses traffic in front to adjust vehicle speed, including stopping the vehicle in heavy traffic and accelerating again. Whoever thought of putting the feature in as an option needs a raise, immediately. Until you’ve tried adaptive cruise control on a long road trip, you don’t know what you are missing. The redesigned interior features a new instrument panel “center stack” that houses the new, larger eight-inch color touch screen. Also a new steering wheel includes controls for the new safety and infotainment features. 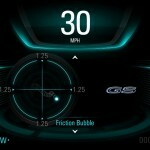 The instrument cluster is also new, with a high-resolution, 4.2-inch color display with vehicle information, navigation, audio system functions, phone features and more. In my Regal GS, an eight-inch configurable color instrument cluster screen is standard. It allows the driver to customize the displayed information with adjustments via steering wheel controls. It’s also complemented with a pair of semicircle mechanical instruments for the tachometer and other vehicle functions, befitting of the GS’s driver-oriented mission. That “driver-oriented mission” is where the biggest surprise for me was found: The new Regal engine is a 2.0-liter four-cylinder with a twin-scroll turbocharger, that produces 259 horsepower and 295 lb-ft of torque. 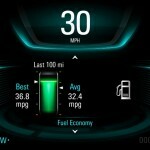 The good thing about the engine is the mileage: At an EPA estimated 27 highway, 19 city and 22 combined, the fuel use, while not remarkable, is still impressive (A 2.4L engine with eAssist light electrification technology is also available on the 2014 Regal (FWD only), delivering EPA-estimated ratings of 25 city and 36 highway). What’s even more impressive though is the drive. The model I tested had the optional all wheel drive (new for 2014) combined with the six speed transmission. GM calls the AWD the Haldex and says it helps make the most of traction in all driving conditions and also enhances the cornering capability of the Regal GS when driven in the GS mode of the Interactive Drive Control System. I can attest that indeed, it does. 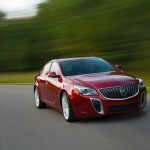 The drive of the Regal GS is remarkable when you consider that a four-cylinder is under the hood. The engine acts like a larger cousin delivering power to the road that is eyebrow rising. No, you won’t leave long number 11’s when the light turns green, but you’ll have more than capable power combined with decent fuel mileage. The electric power steering gives a good feel and in aggressive cornering maneuvers, the AWD really does hold the road impressively. Whatever the Haldex does, it’s doing well. 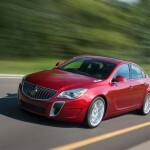 The new Regal with its midcycle refresh is home run for Buick and GM. 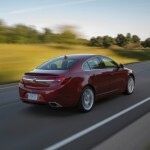 It’s no wonder that in May of this year it was the top selling midsize sedan in America. With a ton of standard features and options that brought my test model AWD GS in at an MSRP of $43,780 it’s a great deal. While I do get to drive many cars, there are few I’d put in my driveway; the Regal however is currently at the top of my driveway list for 2014. Front head room 38.8 in. Front hip room 55.4 in. Front leg room 42.1 in. Front shoulder room 56.7 in. Rear hip room 52.3 in. Rear head room 36.8 in. Rear leg room 37.3 in. Rear shoulder room 54.4 in. Epa interior volume 111.1 cu.ft. Cargo capacity, all seats in place 14.2 cu.ft. Drivetrain 6 yr./ 70000 mi. Roadside 6 yr./ 70000 mi.